Musicinfo has launched the easiest and most efficient digital distribution service for independent musicians and record labels to promote their music in China. Your music will be accessible in all the major music services in China, and thus to every Chinese listener. Best of all your royalties are calculated based on the amount each song is listened to regardless if it is by a free or paid subscription user. Streaming services work the same in China as they do in the Western world but they have a daily listener count multiple times more than any Western service for example, QQ service has over 600M daily listeners. In the past, the production and release of most music was decided by prominent media companies’ executives and investors. They were the ruling overlords who decided the fate and profitability of the humble musician, who they would grant the right to record, how long the musician would serve as their profit puppet and denied those not deemed worthy of their advocacy. They had extravagant studios, expensive equipment and extensive production. This practice still happens today and if you want to be rich and famous and if you were given the chance, you could sign your life to one of these large companies, but there is an other choice. Today, technology has evolved and become so convenient and compact that publishing, recording and promoting music is possible for anyone from your own home. Thus, new music is created and released from individual independent musicians more than ever without the need of the enabling media company. This is a beautiful thing, because every individual has access to facilities to create their own personal voice and vision for all to regard. The flourishing generation of social media has facilitated the blossoming of an extensive abundance of new musicians to the public, which makes finding and listening to new music more difficult than ever. Unfortunately, from the copious amount of music waiting to be heard only a tiny minority will ever make it to the surface with the rest lost to the deep. Independent musicians and record companies make more music than ever, but are just not getting heard in Western services. Major record companies and their artists are increasingly dominating the industry. Streaming services in 2016(Finnish link) offered over 40 million songs, but only 28.3 million songs were listened to. In addition, only 50 songs collected 3.9% of all revenue collected and 5000 songs collected 40.3%, and only 500,000 songs collected any royalties of the 93.6% total streaming volume in Western streaming services. Universal, Sony Entertainment and Warner dominated the market amassing 82% of the industry’s revenue, as independent artists and record companies mustered only 18% in 2017. Major record companies are capable of managing markets, playlists, radio broadcasts and streaming services with vast financial assets, networking resources, executive influence and targeted business partnerships with large distributors such as Spotify. 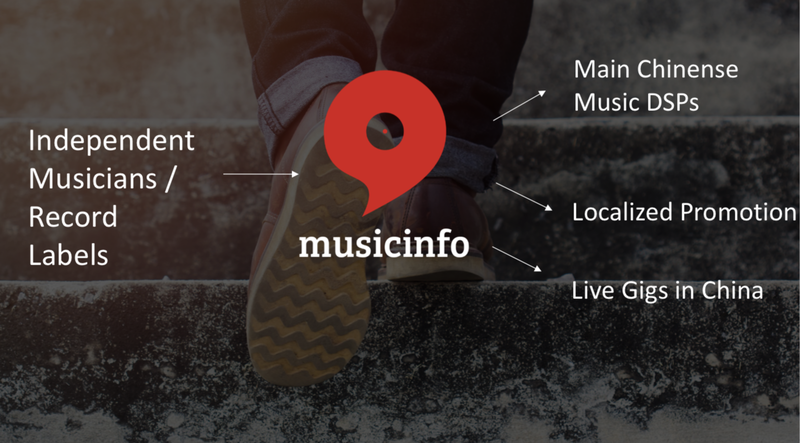 Musicinfo aspires to advocate independent musicians in this universe of information to help them define their music in this growing world of data. We endorse independent musicians and record companies through our knowledge and services to attain their best in China and at home. For everyone at Musicinfo, music is a passion and our confidence in Musicinfo is reflected in the use of our own services. Musicinfo's staff and networks are expanding all the time and are currently serving musicians in China, Europe and North America. Musicinfo helps you commercialize your music in China. Our first aim is to amass your music an audience; We make it accessible for everyone by providing the following choices to best serve our customers’ needs: one (Star), 20 (Gold), 200 (Platinum), or more than a thousand (Diamond) releases to more than 20 listening services in China. The second plan of action is to get you and your music the maximum amount of exposure through our promotion services. Your favored images, video, tracks and text, will be curated and translated into Chinese to be posted in China’s biggest and most influential social media services: Weibo (equivalent to Twitter) and Tencent Media including: Wechat, Tencent News, QQ Kandian and Kuai Bao, which covers 800 million monthly active users. We provide three tiers of service to best deliver your message: Social Media Promotion, Social Media Promotion Pro and Video Sharing. This is essential as most western social media services such as, Twitter, Facebook, Instagram and YouTube are forbidden in China. Musicinfo's new comprehensive service is an asset to independent artists and record companies. In the growing digital music market, the world's largest countries are the last and potentially most lucrative and now can be accessed through Musicinfo. Artists will earn honest royalties according to the reliable evaluation of their music’s consumption, but more importantly they will earn the adoration of a vast new listening audience. This will bring you to your ultimate goal: Live concerts in China! But, it doesn’t stop there. Your recognition in China will impact the success in your own home where you and your music will receive the acclaim you are entitled to. It is a cyclical journey that starts with a dream and a bold venture into a land of possibility. Musicinfo is just a drop in the bucket to the ocean of listeners that could be listening to you and following your music.